Multiple topics about how to maintain solid hardwood. American Hickory – Topaz embodies all the qualities of traditional hardwood flooring. What is the Maintenance of Ferma Flooring Solid Hardwood? How do you clean solid hardwood? Clear the floor: Clear the floor area of any furniture that’s easy to move. Tip: Invest in furniture pads — they make moving furniture much easier, and prevent your floors from getting scuffed. Dry-mop or vacuum floor: This gets rid of all surface dirt and debris. Mop floor, going with the grain: If your floors are polyurethaned, dampen a mop with water and some drops of dishwashing liquid. Be sure to ring out the mop before using it on the floor. Run the mop along the floor and follow the grain of the wood in smooth strokes. Buff floor with a cloth: To lift soapy residue after mopping and to make your floor shine, hold a soft cloth in your hand and use it to rub the floor gently in a circular motion. If it’s still not sparkling, use a wood-floor cleaner recommended by the manufacturer. Tip: Cloth diapers work well for buffing, because they’re very soft and absorbent. How do you repair Solid Hardwood? Even the best solid hardwood floors are vulnerable to problems. The problems range from minor surface damage to serious structural defects. We try to answer all these questions one by one. Dealing with Scratches: Minor scratches in wood floors often can be buffed away using steel wool or progressively finer sandpaper grits. Restrict your sanding to the scratched area, feathering only slightly into the surrounding surface. Sand or buff only in line with the wood grain. Most of Ferma Flooring’s solid hardwood is polyurethane finishes. They are difficult to sand. Trying using a scouring pad dipped in mineral spirits or use a sanding screen. Dents: You can sometimes raise small dents by placing a few drops of water on them and allowing the wood to swell back to its original shape. Applying mild heat with an iron or heat gun helps this process along. Removing Watermark Stains: In general, water is an enemy to solid hardwood. If someone has left a watermark ring from a hot coffee cup or cold glass on the floor, you might be able to extract the stain. Fold a white cloth or rag in half and lay it over the stain. Then set an iron to medium heat and use it to iron back and forth over the stain area. Do this gradually, checking frequently to see whether the stain is disappearing and to make sure you don’t cause further damage. 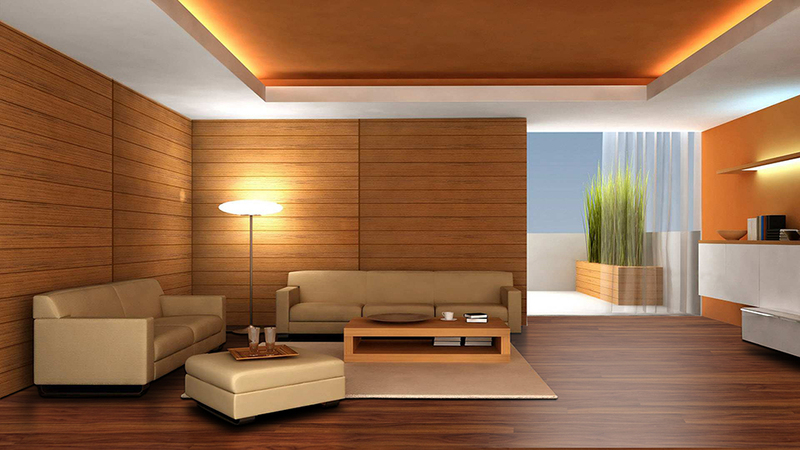 Larger stains on wood floors are typically water marks, caused by spills or over-watering house plants. The area must be sanded, sometimes bleached, and then refinished to match the rest of the floor, which is the trickiest part. It’s a good idea to hire a professional for this work, particularly if the stain is in highly visible area. Replacing Damaged Solid Hardwood Flooring: Badly damaged or rotted sections of flooring must be removed and replaced with new pieces. This involves cutting out a section of the finish flooring, gluing or nailing replacements to the subflooring, filling cracks to match, sanding the surface, and refinishing. If you’re not experienced with this type of work, you’ll find the most difficult part is getting the new to match the old. This job is usually best left to a professional. Will sunlight affect my solid Hardwood? If it does, can it be prevented? Yes, direct sunlight can be a problem for your floors. Sadly, the issue of fading and color change from exposure to direct sunlight does not have a single fix-all solution. But there are a variety of steps you can take, that if done all together, will significantly lessen the amount of direct sunlight your hardwood floor receives or slow the process down. Move Rugs and furniture: From time to time, move around your furniture to allow sunlight to hit the previously covered areas of your floors. If it’s not possible to move furniture, consider clearing at least the area rugs during the sunnier months and replacing them in the darker winter months. Window Coverings: If you can keep sunlight off your floor, it won’t fade as much. Drapes, curtains, shutters or blinds are great defenses against fading hardwood floors. Window films: The next step up is to apply a special film to your windows. These thin multi-layered films are designed to drastically cut down the UV and IR light while allowing different percentages of visible light to come in. There are many brands and companies that manufacture and install these coverings so do your research well before committing to these films. Awnings: One of the best ways of stopping the sun’s harmful rays from damaging your floors is by blocking them before they even get to your windows. Awnings work great in this regard. Low-E glass windows: If you are doing a renovation and are swapping out windows, or you’re building a new home, you consider buying low-E (low-emissivity) glass windows. What’s great about these windows is that they have special coatings that do a great job minimizing the amount of UV and IR light that passes through the panes. There are a few different types of Low-E glass windows. Talk to a glass professional to see which ones are suitable for your home. Do certain sheen levels offer more protection than others? At Ferma Flooring, our solid hardwood only has one sheen level: semi-gloss. What’s the best way to care for solid hardwood floors? Use appropriate tools to clean your floor — a mop used with a machine washable, microfiber pad for dusting and cleaning. Electrostatic action attracts dirt, micro-particles, and common household allergens. Try not to use water and vinegar, soap-based cleaners, wax or steam cleaners on your hardwood floors. Vinegar and water dull the floor’s finish over time, while soap and wax leave residue. Steam cleaners put heat and excessive water on your floor, which can lead to lasting damage. Regular dusting and cleaning keep hardwood floors look new. But protective mats can increase your floor’s lifetime. Use natural rubber rug underlayments with a waffle pattern in entry ways or high traffic areas, and use felt floor protectors on furniture. Daily schedule: Using a microfiber mop or cloth will be your best daily defense against scratches and surface damage. Microfiber cleaning pads utilize static electricity to trap dirt, particles, and other household allergens. Using a broom can be useful as well, but a broom only pushes the dirt around. If you want to clean your floors without damaging them, try not to lift your microfiber mop up off of the floor when you clean. This way, you keep the dirt trapped on the pad. Weekly schedule: Weekly maintenance will deal with the harder to reach areas that a daily dusting can’t reach. Vacuums and wet mops are ideal for getting the dirt out of small, annoying areas such as corners and the spaces between each piece of hardwood. However, when you use vacuums and mops, you need to be extra cautious when cleaning floors because you don’t want to damage the floor. If your vacuum has a beater bar, make sure it doesn’t hit the bar floor. Beware, the wheels on a vacuum might damage the floor. When you’re using a mop, remember that water and solid hardwood don’t mix! Avoid pouring excess liquid on your floor. If you lightly mist your floor with a hardwood cleaner, it will be enough to give your floor a nice clean. Remember: using a gentle touch is one of the best ways to clean solid hardwood flooring. Monthly schedule: Polishing your floor every few months is a great way to clean solid hardwood flooring. Polishing revives and refreshes the finish that protects your hardwood floor. For floors that have some form of protective sealant, it is the finish that is receiving the most attention when we clean — not the actual hardwood. Polishing your floor fills in minuscule scratches and evens out a floor’s protective surface. Polishing a hardwood floor is not a difficult task and can be done with minimal effort. Yearly schedule: Because of all the damage that we put on our solid hardwood floors, consider giving your floor a deep clean or a sand and refinish every 3-5 years. Sanding and refinishing your floor removes the old protective finish and replaces it. If your floor has any deep scratches or gouges, sanding and refinishing will repair this damage, leaving you with flawless and clean hardwood flooring. Is Solid Hardwood good for dogs? Solid Hardwood and dogs do not mix. Unless you are prepared to declaw your dog, you need to adjust the floor to the dog. What’s the moisture content of the subfloor? What is the relative humidity of the jobsite? The moisture content of the wood subfloor should be within 4 percentage points of properly acclimated solid strip flooring (within 2 percentage points of solid plank flooring). For example, if the properly acclimated strip flooring is at 8 percent, the subfloor should have no less than 4 percent moisture content and no more than 12 percent.